UKZN staff at the recent Wellness Days held on all University campuses. 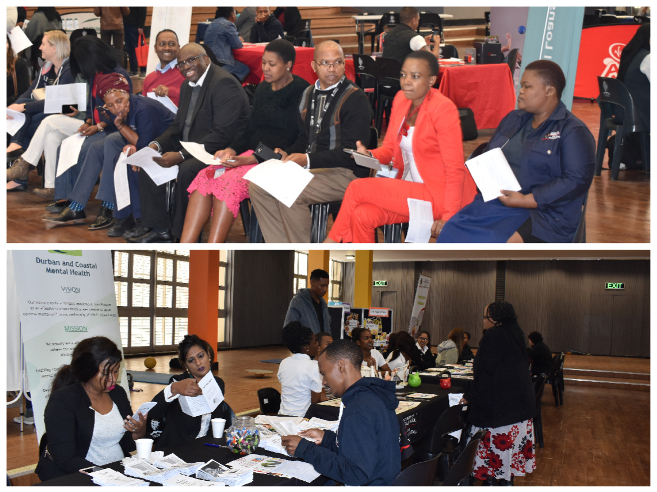 The Human Resources Department, in partnership with the UKZN Medical Aid Scheme, offered University staff health and wellness screenings on all campuses during a two-week campaign. The aim of the screenings was to raise health awareness; uplift staff’s intellectual, social, financial and personal well-being; and encourage a healthy lifestyle. Staff members, including Executive Management, came out in their numbers to take advantage of the wellness information provided by various health service providers. For the first time this year, the Durban Coastal and Mental Health (DCMH) organisation provided basic counselling and information on mental wellness to staff members. The Durban and Coastal Mental Health is the largest mental health organisation in South Africa. It is an independent, registered not-for-profit, non-governmental organisation affiliated to the SA Federation for Mental Health. Follow up appointments were scheduled with staff members who required further assistance. The health screenings were provided by the Optometry, Biokinetics and Physiotherapy disciplines in the School of Health Sciences; while the Discipline of Dietetics at the School of Agricultural, Earth and Environmental Sciences assisted staff with dietary information. The HIV and AIDS Programme provided HIV counselling and testing. Screenings and tests were done for Body Mass Index, glucose, Vitality age, blood pressure, HIV and AIDS, breast issues, fitness and sight. Nedbank offered advice to staff about their financial wellness.